Last year, I published an article called The Contextual Lens. It discussed how I work with wide-angle lenses and why I prefer to call them “contextual” lenses. With their extensive depth of field and wide angle of view, they enable me to frame my subject within the context of its environment, rather than isolating the subject from it. For this reason, I find wide angle lenses particularly beneficial for street photography. They allow me to get close to my subject and become enveloped by the scene, rather than detached from it. Through my use of the wide angle lens, the viewer is transported into the scene, and I believe this is an important element in good street photography. But like a junkie with a jones, I eventually found myself wanting more — more width, more depth of field, more context. Unfortunately, as any photographer knows, the wider the lens the harsher the penalties. With an ultra-wide lens, any object placed near either the left or right edge of the frame will suffer a tremendous amount of horizontal stretching. Quasi-spherical shapes (like human heads) will distort into miniature zeppelins, turning a potentially poignant street shot into a carnival funhouse mirror effect. The impact is quite pronounced with both my 21mm Leica and 15mm Voigtlander lenses so, when using these, I must be especially conscious of objects that lie near the edges of the frame. Fisheye lenses provide one possible solution, since objects near the image borders retain their proper shapes. The tradeoff (and there is always a tradeoff), is that straight lines become curved and every image exhibits the classic fisheye “look.” Sure it’s fun — once or twice. But if you try and create an entire body of work using only the fisheye, your audience will grow bored and annoyed with your photos long before they finish viewing the collection. One can, of course, use software to “defish” a fisheye lens — converting it from a curvilinear lens to a rectilinear lens — but then we’re right back where we started, and objects near the edges are stretched out of shape. My need was clear: I wanted more width, more depth, and more context. My problem was defined: I couldn’t simply slap an even wider lens on a 35mm film or digital camera, because the distortion would counter any extra context I hoped to gain. My solution was obvious: I would need to get a panoramic camera. Panoramic cameras (or rather, cameras designed to capture panoramic images) have been around for as long as photography itself. While the majority of people use these cameras for landscape and architectural work, long time readers know I don’t exactly swim in the big fat part of the statistical bell curve. Instead, I wanted to employ the panoramic camera hand-held and on the streets — where mobility, speed and timing are everything. That’s why the modern digital solution to panoramic photography provided no solution at all. Modern panoramas are created from multiple shots, stitched together in software and output in the desired panoramic aspect ratio. The results can be gorgeous — if you’re photographing static subjects, like landscapes or architecture. I’m not. At least that’s not my primary intention. If I’m looking for some kind of contextual interaction between two subjects on opposite sides of a frame, there’s no way I’m going to capture that by taking multiple photos and stitching them together. Because most photographers now employ the multiple shot stitching technique, there is very little market (just me and a few other oddballs), who would be served by a truly wide format sensor. That means, if I’m going to go panoramic, I’m going to need to go with film. Fortunately, I’m very comfortable switching between film and digital, and I let the demands of the image dictate which format I choose. In the case of single shot panoramic cameras, film has provided a multitude of solutions while digital has none. Since my film exploits mostly revolve around 35mm, I started my search there. Standard 35mm film cameras produce a 36mm x 24mm negative. Inexpensive 35mm panoramic cameras are available, but they achieve their panoramic effect by masking the vertical dimension, giving you a negative closer to 36 x 14. This is useless for my needs since it addresses none of the issues with lens distortion, decreases the amount of usable imaging area, and performs nothing you couldn’t do with 1 second of computer time. Obviously, if I’m going to step up to panorama, I want to see a commensurate step in image quality. So I dismissed the consumer-grade option in far less time than it just took to explain why. The best 35mm panoramic cameras all create a negative that retains the full 24mm vertical resolution, while increasing the negative’s width beyond the standard 36mm dimension. For example, the Hasselblad Xpan creates a 65mm x 24mm negative on 35mm film, essentially giving you the width of medium format with the height of 35mm. Upon considering this, my first thought was “maybe I should just get a medium format panoramic camera?” My logic relied heavily on a single fact — my 35mm scanner, a Plustek 7600i Ai, is designed only for scanning standard 36 x 24 negatives. The whole reason I own the Plustek is that I was never satisfied with the 35mm scan quality that my Epson V600 flatbed delivered. “If I have to use the Epson,” I rationalized, “I might as well shoot medium format.” Alas, my research into medium format panoramic cameras ended almost as soon as it began — those things are huge, heavy and conspicuous. Something like, say, a Fuji GX617 with a 90mm lens weighs nearly 6 pounds and is nearly 1 foot wide. Still, I went to the bother to actually find and handle one. Whoah! I’d be less conspicuous shooting on the street with a toaster oven than with this camera — and the oven wouldn’t be nearly as unwieldy! That cinched it. Though I suspect, even if it hadn’t, the cost issues would have — 4 exposures per roll of 120 film is anathema to my inherent frugality wherever film is concerned. So I resumed my Hasselblad Xpan research with fresh eyes and renewed vigor. The Xpan intrigued me. It handled well. It was fairly inconspicuous, it was compact (given its panoramic dimensions) and it featured a coupled rangefinder. I had only two reservations: the first seemed easily remedied; but the second did not. My first reservation concerned the 45mm focal length lens that’s included with most Xpans. On that camera, this lens would deliver a 71 degree horizontal field of view — slightly narrower than the 73 degree field of view that a 24mm lens would give me on a standard 35mm camera. Although the Xpan’s aspect ratio is panoramic, a 71 degree horizontal field of view doesn’t exactly scream “wide angle!” Particularly not in comparison to either my 21mm or 15mm M-series lenses. Granted, the larger negative would likely result in higher image quality and I would expect to see less edge distortion, but I just didn’t seem to be gaining any additional “context,” which was my whole reason for exploring this avenue. Looking at Xpan photos on the web, I realized that all the images I liked weren’t shot with the standard 45mm lens — they were shot with a Hasselblad Xpan 30mm f/5.6 Aspherical lens. The 30mm gives a 94 degree horizontal field of view — roughly the same as a 17mm lens on a standard 35mm camera, but with (theoretically) less stretching and fewer zeppelin-headed people at the edges of the frame. Nirvana! And this is where I ran into my second, but impenetrable reservation — price. I knew the Xpan was an expensive camera, but if it could deliver the sort of images I had in mind, I would finagle the budget accordingly. The problem is the cost of that gigantic 30mm f/5.6 Hasselblad lens. Specifically, it would demand the same kind of cash outlay as a Leica 50mm f/1.4 Summilux — a lens I’ve desired for eternity; a lens I would likely use constantly; a lens I’ve never been able to afford and will remain unable to afford for the foreseeable future. If donkeys could fly and several thousand $1 bills rained from the sky, I’d gather all those miracle dollars and buy the oft-desired Summilux to photograph those flying donkeys. Unless magic money could fall from the sky more than once, my Xpan plans were dead. Dejected, and with my hopes waning, I began to investigate swing lens cameras — in particular, the Russian Horizon models since they seemed to be the most readily available. I’ll admit I had a sort of unfounded and irrational bias against swing lens cameras, which kept me from considering the option until I’d exhausted all others. But that’s the thing about bias — it’s usually based on ignorance and stupidity. Because the more I bothered to learn about swing lens cameras, the more intriguing they became. For example, I generally prefer mechanical cameras. Score one for the swingers. The Xpan swallows up two CR2 batteries in order to power its autowinder and other assorted bits of electronic paraphernalia. Swing lens cameras? They work the way I like: Load ’em manually, eyeball the exposure, set the shutter and aperture, advance the film manually and, when you’re done with a roll, hand crank it back into the canister. Also, I was initially hoping for something that would give me an even wider field of view (but with fewer zeppelin heads) than a 15mm lens on a Leica M body. After all, maximum context was my ultimate goal. Well, swing lens cameras capture an extremely wide field of view — much wider than any rectilinear wide angle lens that’s ever existed. And they will do this without stretching and distorting subjects placed near the edges of the frame. My main concern was that, like a fisheye, the swing lens would simply replace one form of distortion (edge stretching) with an even more objectionable form (line bending). But here’s the thing: after looking at a lot of swing lens photos, I didn’t find the distortion all that objectionable. Unlike a fisheye, which bows every line in sight, the swing lens (if kept level) only bows the horizontal lines. Depending on what is photographed (and how), this can actually be a somewhat pleasing distortion. And, if you’re either lucky or skilled enough to shoot a subject without too many horizontal lines, you might not even be aware that the distortion exists. And the best thing? I could buy several swing lens cameras for the price of one decent Hasselblad Xpan body, and could probably corner the swing lens market for the price of a single Hasselblad 30mm lens! I’d managed to sell myself on the swing lens concept, but I still wasn’t sold on the Horizon. The old ones were inexpensive, but for every “good” one I read about someone buying, I read plenty of additional accounts of “bad” ones. The modern Horizons, which are now made mostly of plastic, scared me even more. It could be another case of irrational bias, but I just couldn’t see spending a decent chunk of money on a plastic camera. After several weeks, I realized the futility of my procrastination and went to a local camera store to order a Horizon. I stood face-to-face with the sales associate, yet could not force myself to hand over the money. “I’m going to wander back into the used department while I think about it,” I said. 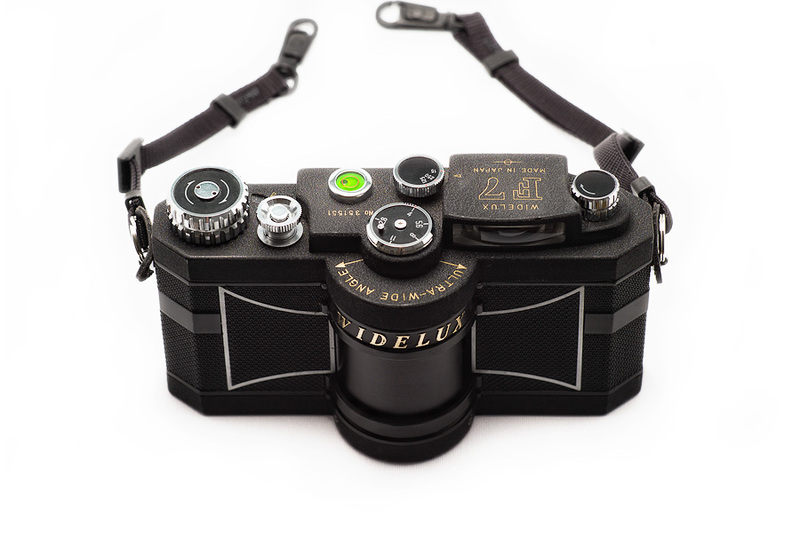 And there, on a glass shelf surrounded by a dusty pile of old Hasselblad 500-series parts, sat a newly consigned Widelux F7. Bang! Done deal! Clutching my little miracle tightly against my chest, I waved to the sales associate as I made my way to the checkout counter. “I won’t be needing that Horizon,” I said. I had no idea what kind of functional shape the Widelux was in. But I had a 30-day warranty period to find out. And, best of all, given its all-metal, all-mechanical construction, I knew any potential problems could be remedied by a decent camera repairman. My journey into the world of colossal context had begun. (This article concludes in Part 2, which discusses the anatomy of the camera, its various eccentricities, and my ultimate delight with its unique view of the world around it). ABOUT THESE PHOTOS: “A Watchful Eye” and “Grade A” were both shot with a Widelux F7 using Delta 400 film exposed at ISO 400 and developed in Ilfotec DD-X. “Skytrain Station – Coming and Going” was also shot with the Widelux, but using Tri-X film exposed at ISO 400 and developed in Ilfotec DD-X. Always enjoy your posts and especially love that you’re from Vancouver! Had a quick question about your Plustek. Would love a quick comment on your experience. I have to widelux F6B, and F8, anf the X-pan with the 45mmm. Both are really good cameras, but the aestethic results very different. Axel: http://www.butkus.org has thousands of old camera manuals online.